Hugh Taylor was born in Cookstown. He was the son of James and Elizabeth Taylor, and brother of Hetty, Emma, Mabel, Margaret, Thomas, Samuel, Oliver and William. 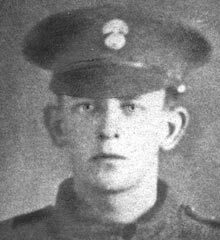 Hugh Taylor worked at Gunning’s Factory, Milburn before enlisting with 9th Battalion Royal Inniskilling Fusiliers in Cookstown. 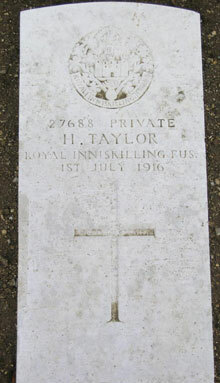 Hugh Taylor was killed in action on Saturday 1st July 1916, and is one of the few Cookstown men killed on that day to have a known grave.